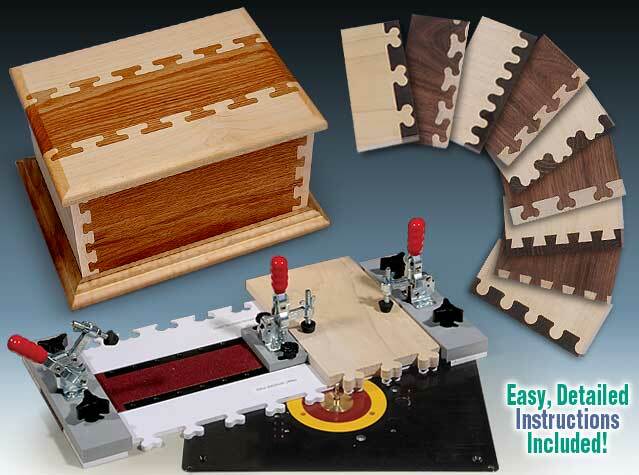 Currently viewing the category: "MLCS"
You’d be hard-pressed to call most router tables portable, even the benchtop ones. Bucking this trend, MLCS sells a portable router table that folds up compactly for easy transport and storage. MLCS coats the 1″ thick, 24″ x 16″ MDF top with Melamine and runs banding around the edge for a finished look. The 11″ long, hinged legs fold up for transport and lock into position when in use to support up to 150 lbs. To help the table stay in place when it’s set up, they coat the bottom of the steel legs in rubber. 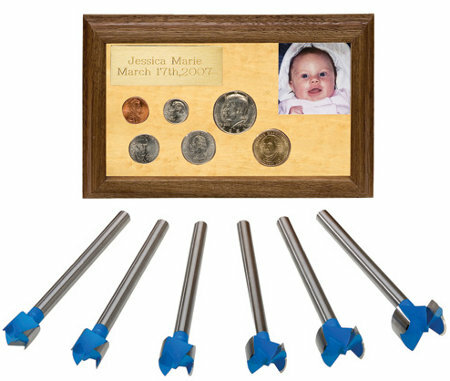 Whether you want to build a unique storage case for your coin collection or find a classy way to mark the year you built your woodworking project, you’ll be hard pressed to find the right-sized bit in a regular Forstner bit set. What you need is a coin-sized Forstner bit set. Good Forstner bits can be expensive; you don’t want to just chuck them out when they get dull. 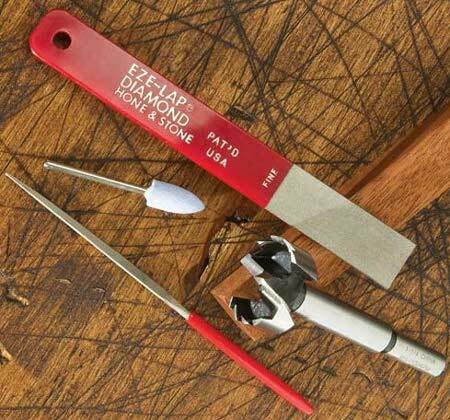 You could bring them in to be sharpened, or you could do it yourself with a few simple tools that you can acquire separately or buy in a kit from several different retailers. 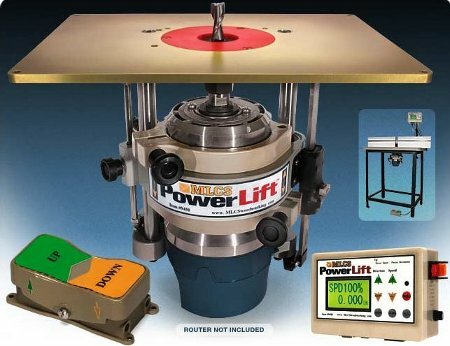 We just covered the Sidewinder router lift from Woodpeckers which moved the height adjustment from the table top to the side for easier access, but how about going one step further and motorizing the lift so you can adjust the height on the fly? The MLCS PowerLift does just that. Controlled with a foot pedal, you can make adjustments to the height in increments as small as .005″. You can watch the speed, direction, and height of the lift right on the digital control panel. The lift also has a depth stop so it will stop when you reach the desired cutting depth and can lift the router motor high enough so you can change bits above the table. To eliminate backlash when raising and lowering the router, MLCS connects the DC motor to the lifts screw by cogged pulleys and belts. MLCS sells a simple fix for a problem I didn’t know existed — evidently some router guide bushings can vibrate loose under use. 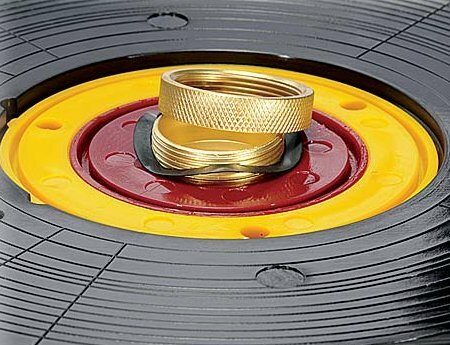 Their solution is to sell you a spring washer that keeps pressure on the bushing nut so it won’t turn during use. Imagine my surprise when I was a Harbor Freight last Friday and saw a Central Machinery drill press table for $30. I just worked a handful of nights and spent that much alone for the T-slot router bit to build my own table for the last part of the DP 350 review. Toolmonger covered the inexpensive MLCS table before, which cost $60, but you had to deal with the wait and the shipping charges. 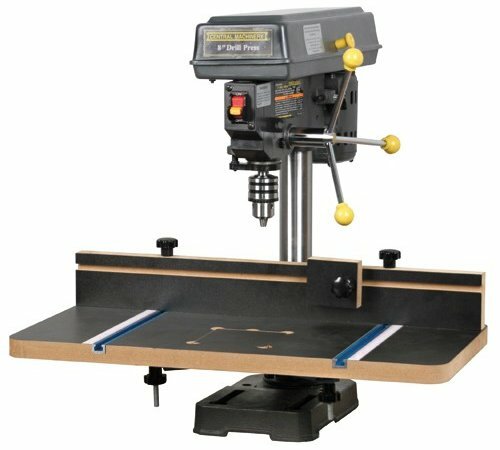 In comparison, Rockler’s cheapest table runs $100 and their deluxe model runs $120. This table from Harbor Freight beats the cheapest one mentioned by $30. But what does $30 buy you? First, the 1″ thick particle board table measures 23-7/8″ by 11-5/8″ and can accept a sacrificial throat insert to back up your holes. The 1″ thick fence rides on an aluminum T-track and is adjusted by loosening two top mounted knobs. 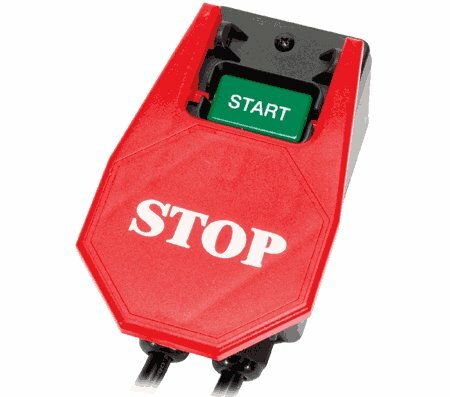 A T-slot in the fence accepts other accessories, like the included stop block. The T-track on the table can also be used to mount hold-downs and other accessories. Along both of the aluminum T-Tracks is a ruled stick-on tape for setting the fence. If you just need to create simple box joints rather than fancy joinery, MLCS has another system for quickly producing these joints on your router table. The three different spacer bases in the Multi-Joint system allow you to make 1/2″, 3/8″, and 1/2″ box joints as well as rabbet, dado, spline, and sliding dovetails. The bases are 24″ long pieces of laminated MDF with guide bars made from ultra-high molecular weight polyethylene (UHMW). 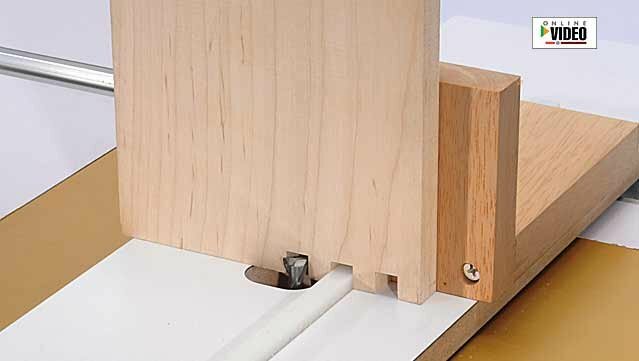 To create interesting joints, previously we covered Isoloc joint templates for Leigh dovetail jigs, but the templates were expensive — plus, you need to already own an expensive Leigh dovetail jig. 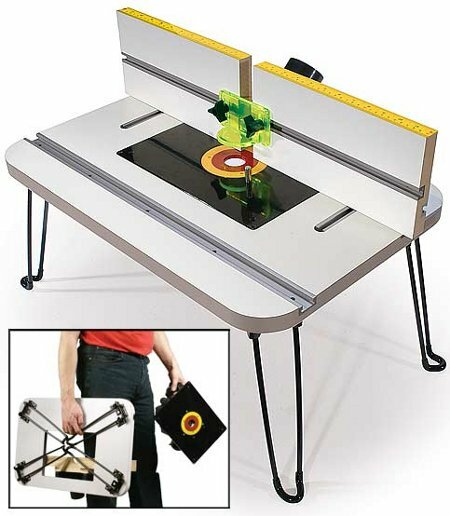 MLCS now sells the less-expensive Fast Joint system that you can use with a router table to make similar fancy-looking joints. Using the system is pretty straightforward. 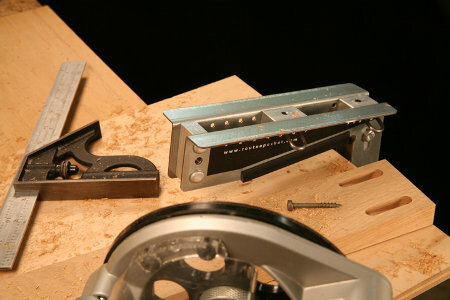 Fit the male and female templates in the Fast Joint jig, install the correct bushing in your router table, chuck the bit into your router, and lock the work piece into the jig. Then just start routing. After you finish the first piece, flip the jig over to use the complementary template and lock in the mating work piece.